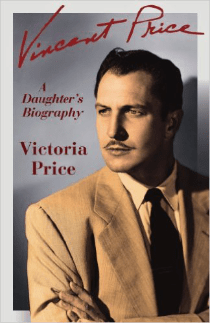 Vincent Price: A Daughter’s Biography by Victoria Price, is a look at the life of the great Vincent Price through the eyes of his daughter, Victoria Price. Two things are clear in reading Vincent Price: A Daughter’s Biography, Victoria Price adored her father and had something of a complicated relationship with him. Born at height of his success, Victoria blames his third wife, Coral Browne, for the strain in the father/daughter relationship. Certainly, the bulk of interviews on which the book is based took place after Browne’s death. Much of what Victoria relates is common knowledge. Vincent Price came from a fairly affluent family from St. Louis (as a side note, the family spent their summers in Amherstburg, Ontario—my current hometown). He studied art history at Yale and started his career as a character actor. Price frequently played the bad guy until coming into his own as a standard of the horror genre in the 1960s. The author tends to talk about her father’s films in passing. She seems to lack an in-depth knowledge of his work. While she does not show resentment in words of the films, taking her father away from her for long periods of time—her lack of interest in his work speaks louder than anything she could say. She laboriously details her father’s marriages and early misjudgments but what attracts the reader, his acting genius, is glossed over. Much of the biography deals with Price’s love of the arts which seems to be the true point of connection between him and his daughter. Victoria also holds a degree in art history and is an interior designer. Victoria, in no way, defies her father. She relates to the reader his anti-Semitism and initial Nazi sympathy (he attended one of Hitler’s rallies while on a trip in Europe). Despite her close relationship with the subject and perhaps a desire to whitewash, Victoria maintains a professional distance. The book reads as though the author wants us to know her subject and understand him instead of capitalizing on a connection to fame. Some reviewers have speculated at the publishing date conveniently falling after the death of the subject. I think it’s simply that much of the research took place in Price’s final years. Vincent Price: A Daughter’s Biography is well written and engaging. If you’re interested in Vincent Price, it’s one of the better biographies I’ve read depicting him as the man we didn’t see on screen. For more information about Victoria Price, visit her website. You can connect with her on Goodreads, Facebook and Pinterest. In 1957, Vincent Price donated 90 artworks to the Vincent Price Art Museum in California. It became the first “teaching art collection” at a community college. The art collection includes paper, painting and three-dimensional objects. Sites and accounts dedicated to the legacy of the actor and director, Vincent Price: website, Facebook, Pinterest and Google+ and Twitter account @MasterofMenace.